Enter into the QVC Can You Dig It? 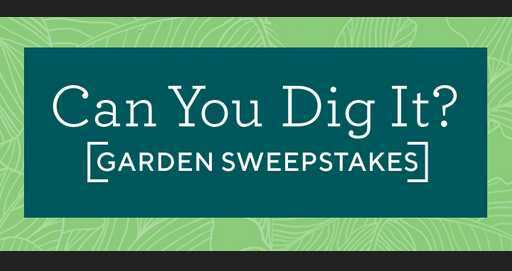 Garden Sweepstakes now through April 30, 2019 at www.qvc.com for your chance to win grand prize of $5,000 cash and other exciting prizes every week throughout the sweepstakes period. Prize(s): There will be total hundred two (202) prizes will be awarded in this Sweepstakes, Which are following: 4 Grand Prizes- $5,000 cash in the form of a check, (198): A total of twenty-four (24) Weekly Sweepstakes Prize Packages will be awarded (four (4) per week for six (6) weeks), consisting of: 5′ Potted Fiddle Leaf Tree in Pot by Valerie, Two (2) 50’ Bernini Pro Series Metal Garden Hoses, One (1) Bernini Rechargeable Fountain, One (1) DynaTrap® DT2000XLP – Decora Tungsten 1 Acre Outdoor, plus 1 extra AtraktaGlo Light Bulb set, Four (4) AtraktaGlo Bulbs for Flylights, Two (2) 50’ Bernini Pro Series Metal Garden Hoses, 6pc Fragrant Penny Series Viola, 100’ Outdoor Extension Cords, DynaTrap DT2000XLP – Decora Tungsten 1 Acre Outdoor, plus 1 extra AtraktaGlo Light Bulb set, 1pc Quick Fruiting Meyer Lemon Tree OR One (1) 1pc Non-Grafted Chinese Tree Peony (red) and much more. Total ARV of all prizes is:$26,751.44.!! When To Enter: This sweepstakes entry begins at 8:00:01 AM (“ET”) on March 21, 2019, and all entries must be received by 11:59 p.m. ET on April 30, 2019.